Krabi International airport will close its runway for repairs between midnight to 5 am, starting tonight (Mar 6), but it won’t affect regular flights, airport director Attaporn Nuang-udom said. He said the five-hour closure during the night would not affect regular flights, but chartered planes landing and taking off after midnight. During the closure time, most planes landing and taking off are chartered flights, or just 5-6 flights a day. So, this will not affect regular flights at the airport, he said, adding that the repairs of two cracks on the runway will take one week to complete. The director said the the first crack is on runway 32 which is 95 metres from the head end of the runway, while the second crack is on the western runway 14 where its asphalted surface peeled off. Each crack is three metres wide and 5 metres long, Mr Attaporn said. Besides repairing the two cracks, the airport’s 3-kilometre long runway will also undergo maintenance to ensure safety for aircrafts. Earlier last week an image was posted on the social media by an “anonymous pilot” showing two cracks at both ends of the runway. The post has reportedly drawn many responses, with some pilots expressing concern that the cracks which were caused by the peeling off of asphalted surface could pose a risk for planes during takeoff and landing. 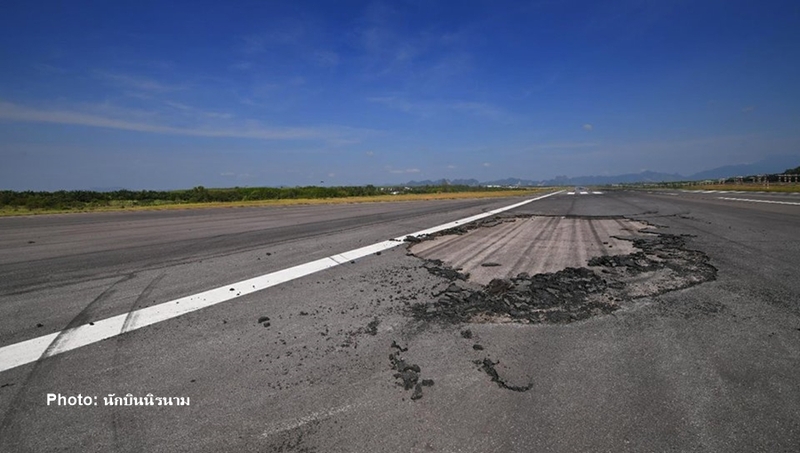 A few of the critics noted that the cracks were known since mid-February, but the airport management did not close the runway for repairs, but chose to warn pilots to exercise more caution. Over 100 flights use the airport every day.